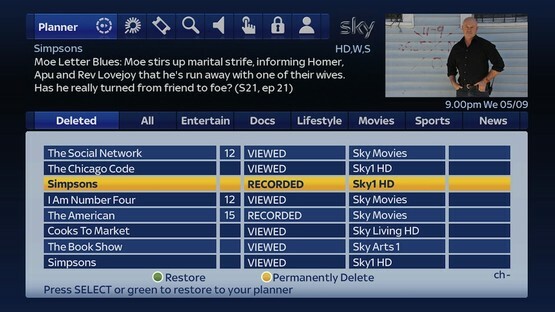 Sky has announced a new update to its Sky+ box functionality today to help undo all those mistakenly deleted recordings you do with the dreaded yellow button! 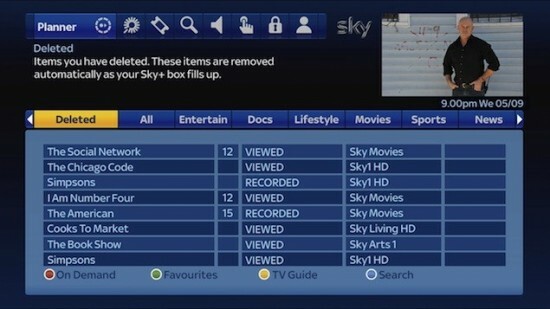 Yes, users with a Sky+ box will now have the feature to access a deleted programs menu in the Sky planner that will list all of the recently deleted programs, wherein you can restore said programs if you wish to re-watch or to simply rectify an accidental deletion. Additionally, if you are sure you want to remove the programs from the deleted folder you can then delete a recording permanently. Alternatively, the Sky+ box will automatically delete the oldest items to free up memory space if you leave your recordings for a certain period of time. Sky has said that the update will be rolled out in phases, but owners of the latest Sky+ HD box (DRX890 model) and the Sky+ HD 1TB box can expect to enjoy the new features first. Sky has also announced a new Sky Anytime and Anytime+ service that enables Sky+ content as an On-Demand service, which will provide a larger choice of Sky content to be viewed at any point, whenever you want. And finally, Sky has said that its new catch-up TV service is also nearly done and ready to go, with the company confirming it is in the final stages of completion. When completed, Sky users will be able to view on demand catch-up TV from the last 7 days from Sky channels as well as ITV Player, Demand 5 and, “shortly after launch”, BBC iPlayer. These features will all be coming to users on the newer Sky+ HD box with no news on the features coming to older Sky box customers.